On St George’s day, we celebrate all things English by speaking to one of the original English gentlemen of wine, Steven Spurrier. Decanter Man of The Year 2017, much-revered character within the wine world at large, and English Sparkling winemaker, he will release his memoirs “Wine: A Way of Life” next month. 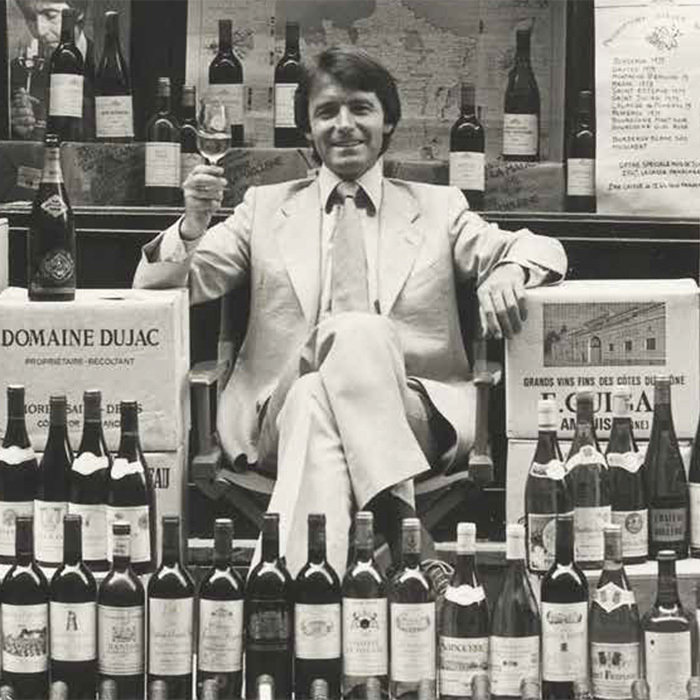 Spurrier has spent substantial time living in France, most-famed for opening his wine shop “Les Caves de la Madeleine” in 1970 just off Paris’s Rue Royale. But this arrival to the country wasn’t necessarily under the premise of working in wine. “I had a lot of creative ideas and I’d bought a ruin in the south of France and I said to Bella, why don’t we go and live in Provence? And so the day we got married we left on the Golden Arrow.” At that time he was working in antiques – a subject, still very much close to his heart, and had great plans to turn the French house into an art gallery (“I spend much more money on art than I do on wine,” he says); these days, he has a keen interest in outside sculpture and the work of Steven Spurrier, the painter (not the same person). Steven is now looking forward to stepping back a little, and to becoming an “observing participant”. But he shows no signs of stopping either. Current projects include blending wine in India with winemaker Piero Masi at the Fratelli Winery “it’s rugged vineyard land” – wines mostly made with Sangiovese, a grape he deems he would never wish to be separated from. He will also be hosting an “into the future” tasting with Eduardo Chadwick in Paris and London in early June. A competition between English Sparkling Wine and Eduardo’s iconic brands – the person who has since been awarded Decanter Man of the Year, 2018. The pair hosted “The Judgement of Berlin” together, a reprisal of one of Spurrier’s most famous moments – hosting “The Judgement of Paris” in 1976 – a stake in wine history so prominent that it was made into the movie “Bottle Shock” (Spurrier himself is not a fan). The real events however cannot be underestimated in how much they have since changed the landscape for Californian and French wines, a legacy that still prevails today. Steven Spurrier will be signing his book at Berry Bros. & Rudd’s 63 Pall Mall shop on Wednesday 13th June. It is released on the 28th May. great blog, good luck with the book. Great, looking forward to the book. Terrific – looking forward to reading the book!